The last several times I’ve been to Phoenix I’ve seen these U.S. 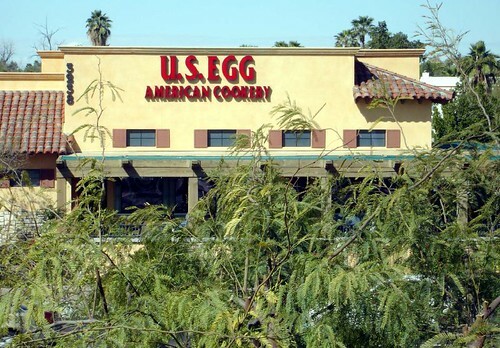 Egg Restaurants around the area. There are only two of them but I guess at least one must have been on our way to and from wherever. I liked the name and for some reason the place had just appealed to me but they were never quite in the right place to stop by for breakfast. This year that all changed. The hotel we stayed in was directly across the street from the Scottsdale location. Couple that with the fact that my previous favorite breakfast place, Jacqueline’s Market Place, is now called Caramba! and you have the perfect setup for a visit to the new place! Saturday morning M and I wandered over to check the place out. It’s big, full of light and we were greeted and seated by a very friendly host. The place was jumping – full of both locals and tourists. The menu is very extensive and what I love about this place is that they are only open for breakfast and lunch so they really specialize in those items. It took M and I awhile to make a decision – so many great sounding choices! I believe M ordered the French Toast, although at the moment all I can remember is what I had – "The Border’! 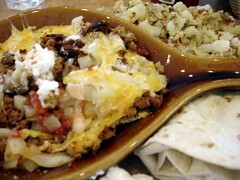 The Border is an open faced omelet topped with cheese, onions, salsa and beautiful, spicy chorizo. Served with a side of potatoes (I really wanted hash browns but no one makes them any more!) and a tortilla. I was in heaven. I really liked this place and will have to stop in next time I’m in town. The staff is friendly, the food is good and there were several more things I would have liked to try. I don’t know though – I can already here the chorizo calling my name….